Thursday, the 12th we'll open as usual at 10:00 a.m. and all bolted fabrics will be on sale, 20 % off, half yard cuts or more. Thursday evening, at 6:00 p.m. we'll have Schoolhouse, a special event. Guests will rotate through five different stations and have an opportunity to see many new tools, projects, notions, and gift ideas for Christmas The store will stay open until 9:00 p.m. and refreshments will be served. Spend this time with us and learn new techniques, visit with friends, and enjoy some quilting time. Friday we’ll have normal hours 10:00 a.m. to 6:00 p.m. and on Saturday we will close at 5:00 p.m. 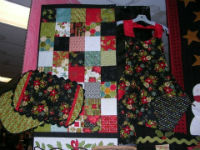 Some of our new projects include Christmas quilts, holiday table runners, pillows, the cutest Halloween wall hanging you've ever seen and many ideas for gifts. This just names a few of the many samples we have been working on. Peek at just a few. . .
the back and is so easy to put on! Make holiday ties for your favorite men! Here comes Santa and Looking for Rudolph! Two great new patterns from The Quilt Patch and we’ve made them! Kits for sale July 12. From The Wooden Bear Designs, we have an adorable new book with collection of simple holiday projects to decorate your home or give as gifts. These projects are just a very tiny peek at all that is new at Valley Fabric Shop. Join us July 12-14 for a few days of fun, food, and fabric!